While submitting a form's data,the password is visible in encrypted format inside the form data and also in the parameters of the POST request. I am using sha-512 for encryption and the url is https. I have been searching on this but all I have found is just to change the protocol to https from http.Please help me how to solve this issue of hiding the form data from showing the password in the POST request header parameters. Indeed, the browser shows you all data that has been posted. Effectively the request has been done on behalve of user and you have to assume the user can see all information he/she has posted. I want to hide the password in the encrypted format. Yes, this is the correct answer, https ensures the traffic is encrypted and server authenticated and anybody sniffing out the traffic would be unable to decrypt any of posted data. What you see in the browser are data before encryption and actual transmission. Nope, seems you just hashed some data (please search and learn the difference between encryption and hashing), now the hash has became the password, now you need to protect the hash. Nothing you've shown indicates the CWE-204 vulnerability. 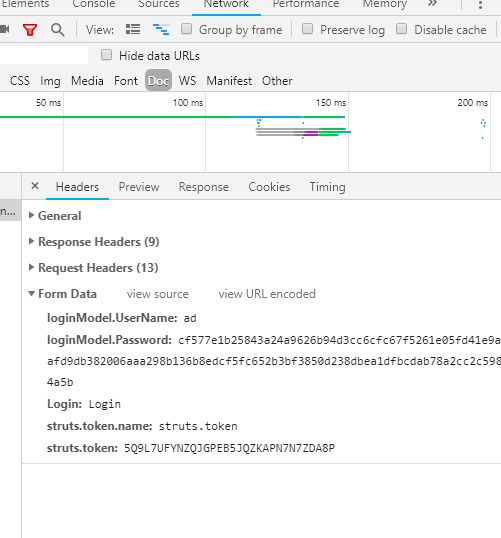 What you've shown is a normal post request and response with a session cookie and redirect url. Your system may or may not have the CWE-204 vulnerability, though it has nothing to do with the data you've provided. Is the password provided by the user and do you want to hide the password from any 3rd party (potentially sniffing out the traffic)? Then using https will do the trick. The user may still see the posted data (including the password), but well - the user provided the password, he knows it already. If the "password" some system parameter you want to pass in the form without the user able to know it? In theory - you may encrypt the password on the server-side and decrypt the password on the target system. However - the user may just post the encrypted password again. Then you may rather use time-limited JWT token. Not the answer you're looking for? Browse other questions tagged encryption sha web-development-server burp or ask your own question. How to send password securely over HTTP? How to encrypt the http request sent to server? How to sign in to Google then get the output html?